The Detroit Red Wings have not been the most consistent team this past month, they have been plagued by poor play, giving up leads and not finishing. The Detroit Red Wings lost the winter classic too after making a great comeback, but lost in overtime. Over this past stretch, they haven’t been able to stick together two wins, and have struggled to build any momentum and simply have not played a full 60 minutes. Now, they’ve lost three of their last four games after losing 6-3 loss to San Jose this past Saturday. Tonight, they’ll have to play hard if they want to find their footing, and it won’t be easy since they’ll be on the road Tuesday night against the rising Chicago Blackhawks. Chicago so far, has won three straight games and has turned their momentum around after having problems of their own. “Hopefully, we don’t feel too good about ourselves because we win one game,” Red Wings center Frans Nielsen told media after Saturday’s loss. “I don’t know if we have a different mentality after a loss, (when) coming out, you want it a little more (and have a) little too much confidence after a win. But Detroit might get some help soon since local media in Detroit reported on Monday that the Wings might get forward Justin Abdelkader and defenseman Mike Green back against the Blackhawks, and that could provide them the boost they so desperately need. Abdelkader, has four goals and four assists in 22 games this season. He hasn’t played since Dec. 1, when he went out due to a sprained MCL. Green on the other hand has been dealing with an unspecified ailment, and got injured on Dec. 17. He has seven goals and 11 assists in 32 games. Both players skated with the team on Monday and looked ready to play. Detroit coach Jeff Blashill spoke with reporters on Monday, and told them that he will decide gametime Tuesday if the two will play in Chicago or not, meaning they will travel with the team. The Blackhawks are in mid-stride, finally getting on a three-game winning streak. They only found their rhythm after losing five of its previous six games before being able to string together three wins, all at home. So, beating them at home tonight will not be easy. Going into Tuesday night’s game, Chicago is 16-4-4 at the United Center, this is the last of a four-game homestand before they hit the road to face the Washington Capitals in Washington on Friday night. “It’s huge,” Chicago winger Patrick Kane told reporters after Sunday’s win where rookie Ryan Hartman had a unique hat trick that included two empty-net goals. Teammate Duncan Keith is also doing well with an assist in his last four games. Kane got three assists in that game and has his mojo back too. He’s bagged six assists in his last three games. 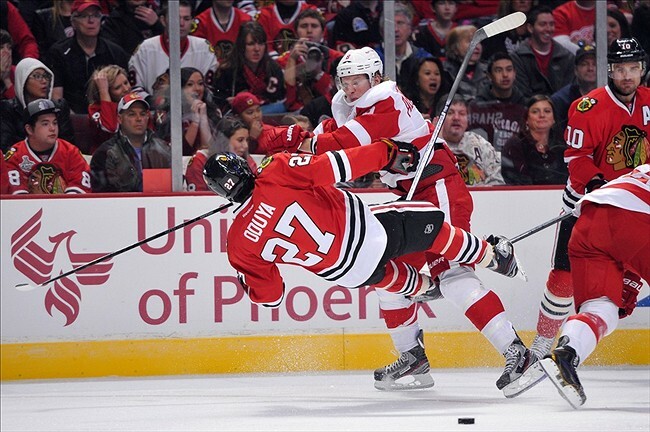 They should be better tonight, and Detroit will have a hard time fighting that flow. The Red Wings have struggled to stay afloat in a very close and competitive Eastern Conference, and are currently tied for the second-lowest point total.